"After continuing to accelerate to an annual inflation rate of 25 per cent in the first half of 1920, in the second half of the year the price level plunged by an annualized rate of 15 per cent. In the entire macroeconomic record of the US, this switchback is completely unique. In the Great Depression deflation was even sharper, but it did not follow a period of rapid inflation. In 1920 as prices fell, industrial output plummeted and unemployment shot up. By January 1921 the National Industrial Conference Board estimated that industrial unemployment topped 20 per cent. "But it was agriculture that suffered the worst. ... As cotton prices collapsed, farmers resorted to 'night riding', threatening arson against ginneries and warehouses that paid inadequate prices. A new generation of populists organized in the cross-party 'Farm Bloc' tarred Wilson's Fed with responsibility for 'the crime of 1920'. One of the first actions of the incoming Republican Congress was a Joint Congressional commission of agricultural inquiry, to embarrass the outgoing Democrats. 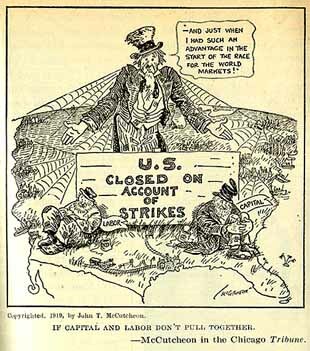 Meanwhile, Wilson's former controller of currency, John Skelton Williams, fanned the storm of agrarian protest by alleging that the mishandling of the crisis and the collapse in farm prices were the work of a Wall Street cabal. "Across the South and much of the West, the agrarian crisis fuelled the second coming of the Ku Klux Klan. Feeding off popular discontent across the American heartland and supercharged by a highly incentivized recruitment system, membership in the Klan surged from a few thousand in 1919 to as many as 4 million by 1924 -- one in six, the Klan claimed, of the eligible white male population. At their peak thousands of inductees were initiated en masse in torch-lit monster rallies. In northern Florida entire city neighbourhoods were cleared of their black inhabitants. 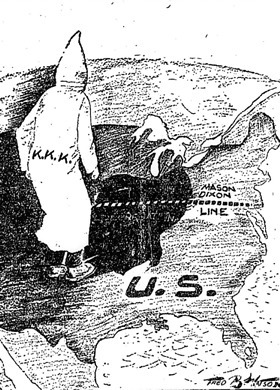 In 1923 Texas, Alabama and Indiana all returned Klan candidates to the Senate. Southern Illinois was convulsed by white on white 'Klan wars'. Oregon's state politics were entirely under the spell of the local Grand Goblin. In Oklahoma the Klan's influence on the state legislature, court system and police force was such that the state governor was forced to resort to martial law."